One of our facebook members had a need for a couple 2020 parts for a build they were doing so I figured I would follow thru and model other parts for a 2020 extrusion build. 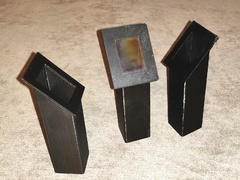 These parts are similar to what might be used on a 3030 Haribo build with the exception they have been designed for the 2020 Aluminum extrusions. As time allows I will add more of any required parts to this archive to allow for a complete 2020 build. Whats in the archive to date? Rematch : Who Printed the CASTLE Better, Da Vinci Pro or Prusa i3 MK2 ?? ?